Ra Pharma Announces Positive Results from Phase 1b Pharmacokinetic Study of Zilucoplan (RA101495 SC) in Patients with Renal Impairment - Ra Pharmaceuticals, Inc.
CAMBRIDGE, Mass.--(BUSINESS WIRE)--Sep. 26, 2018-- Ra Pharmaceuticals, Inc. (Nasdaq:RARX) today announced positive results from the Company’s Phase 1b pharmacokinetic (PK) study evaluating zilucoplan (RA101495 SC) in patients with renal impairment. The Company has received International Nonproprietary Names (INN) clearance for use of the name zilucoplan from the World Health Organization. The Phase 1b, multi-center, open-label trial was designed to evaluate the PK profile of zilucoplan in patients with severe renal impairment as a lead-in to studying zilucoplan in complement-mediated renal disorders. The trial enrolled 16 subjects, including eight patients with severe renal impairment matched with eight healthy control subjects with normal renal function. Each patient received a single, subcutaneous dose of 0.3 mg/kg of zilucoplan. 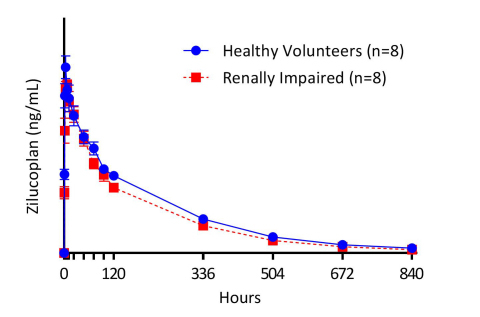 The PK profile of zilucoplan was consistent across both groups, with exposures similar in renally-impaired patients and healthy volunteers (Figure 1). There were no adverse events reported. Overall, the data indicate that zilucoplan can be used in clinical studies of patients with renal impairment without any need for dose adjustment. Zilucoplan is currently being studied in a Phase 2 study in generalized myasthenia gravis (gMG) with a top-line data read-out expected around year-end 2018. The Company also recently completed interactions with regulators, including the U.S. Food and Drug Administration, for its global Phase 3 program of zilucoplan for the treatment of paroxysmal nocturnal hemoglobinuria (PNH). Based on these interactions, Ra Pharma plans to initiate a global, pivotal, single-arm Phase 3 trial in treatment-naïve PNH patients during the first half of 2019. Ra Pharma is developing zilucoplan for paroxysmal nocturnal hemoglobinuria (PNH), generalized myasthenia gravis (gMG), and other complement-mediated disorders. The product is designed for convenient, once-daily subcutaneous self-administration. Zilucoplan is a synthetic, macrocyclic peptide discovered using Ra Pharma's powerful proprietary drug discovery technology. The peptide binds complement component 5 (C5) with sub-nanomolar affinity and allosterically inhibits its cleavage into C5a and C5b upon activation of the classical, alternative, or lectin pathways. By binding to a region of C5 corresponding to C5b, zilucoplan is designed to disrupt the interaction between C5b and C6 and prevent assembly of the membrane attack complex. This activity may define an additional, novel mechanism for the inhibition of C5 function. This press release contains "forward-looking statements" within the meaning of the Private Securities Litigation Reform Act of 1995, including, but not limited to, statements regarding the potential safety, efficacy and regulatory and clinical progress of our product candidates, including without limitation zilucoplan, beliefs regarding clinical trial data, statements regarding trial design, timeline and enrollment of our ongoing and planned clinical programs, including without limitation our Phase 3 trial of zilucoplan for the treatment of PNH, upcoming milestones, including without limitation the release of top-line data in gMG around year-end 2018, and expectations surrounding USAN approval of the name zilucoplan. All such forward-looking statements are based on management's current expectations of future events and are subject to a number of risks and uncertainties that could cause actual results to differ materially and adversely from those set forth in or implied by such forward-looking statements. These risks and uncertainties include the risks that Ra Pharma's product candidates, including zilucoplan, will not successfully be developed or commercialized, in the timeframe we expect or at all; the risk that topline results as of February 7, 2017 from the Company's global Phase 2 clinical program evaluating zilucoplan for the treatment of PNH may not be indicative of final study results; the risk that USAN does not approve the name zilucoplan; as well as the other factors discussed in the "Risk Factors" section in Ra Pharma's most recently filed Annual Report on Form 10-K, as well as other risks detailed in Ra Pharma's subsequent filings with the Securities and Exchange Commission. There can be no assurance that the actual results or developments anticipated by Ra Pharma will be realized or, even if substantially realized, that they will have the expected consequences to, or effects on, Ra Pharma. All information in this press release is as of the date of the release, and Ra Pharma undertakes no duty to update this information unless required by law.